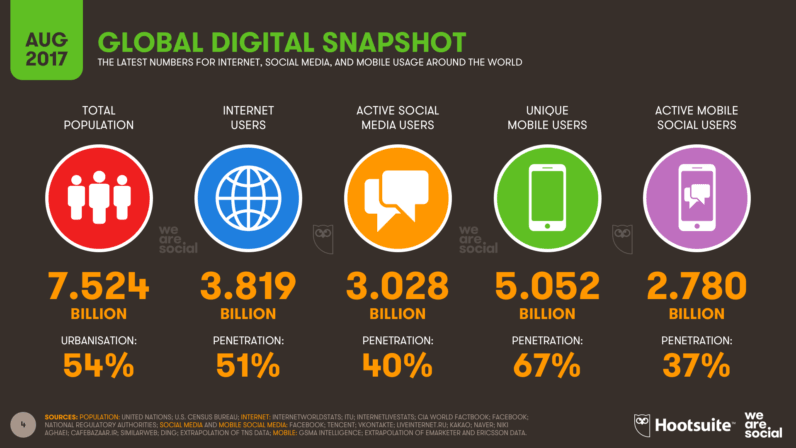 Social media: The world’s favorite online pastime? At a local level, WeChat consolidated its lead in China, with more than 870 million people in the Chinese mainland now using Tencent’s most popular platform — that’s more than 90 percent of the platform’s total 938 million users. It was a similar story in neighboring South Korea, where Kakao Talk posted small local gains to reach 42.4 million users in its top country. VK (also known as VKontakte) had a tougher quarter after the platform was blocked in Ukraine, which put a significant dent in its overall MAU numbers. Facebook was the main beneficiary of the block, with growth in Facebook users in the country accounting for more than 60 percent of the drop in VK’s local numbers in the past couple of months. Ericsson’s latest Mobility Report shows that the potential for connectivity continues its relentless advance too, with smartphones accounting for four out of every five phones sold in the first quarter of 2017. Data from Ericsson also shows that video accounts for 42 percent of mobile data traffic, compared to 58 percent of the mobile data traffic associated with tablets. Conversely, social media use accounts for a far higher proportion of smartphone data traffic compared to tablets.